In 131 Ice Cream Maker Recipes, there is a delicious homemade ice cream to meet every need: regular, low calorie, sugar free and non-dairy. Anyone can make a homemade ice cream to suit their need. Ice cream fills a useful place in homes throughout the country. It is a favorite for desserts or snacks incorporating an array of many flavor variations. With the recipes provided, everyone will be able to enjoy some type of this taste tempting food. So lets mix up a batch of ice cream for anyone and everyone to enjoy! Can you imagine the creamiest, dreamiest, yummiest frozen desserts youve ever tasted. Now try to imagine having it all for yourself whenever you want it! 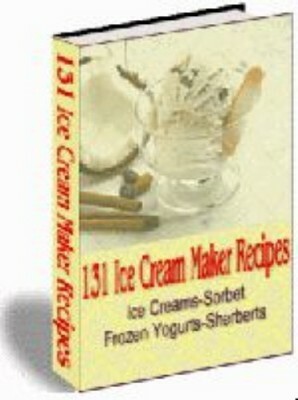 131 Ice Cream Maker Recipes takes homemade ice creams, sherberts, frozen yogurts and sorbets to a new level.